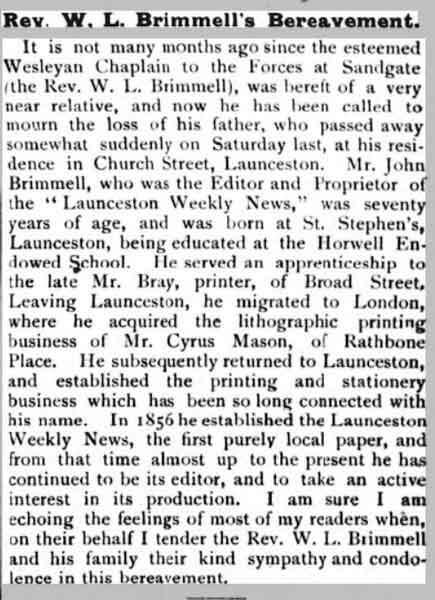 The bio of John Brimmell | Launceston Then! 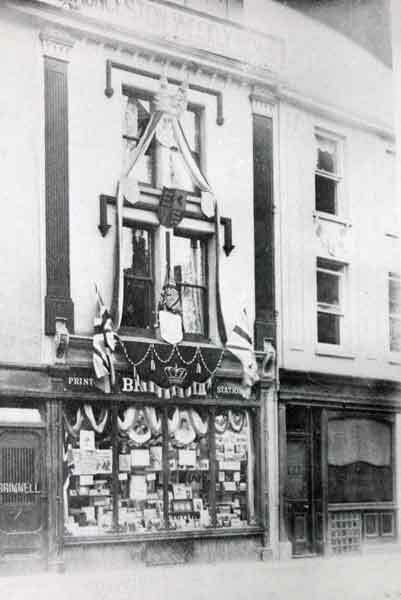 Brimmell’s, Church Street in 1902. John Brimmell was born in 1829 at Newport, Launceston to George and Fanny Brimmell. He was the eldest son of six children, having two sisters, Sarah and Fanny, and three brothers George, William, and James. His father was a mason’s labourer but had also served with the British Army, belonging to the Royal Sappers and Miners and had seen action with his corps at ‘The Battle of Waterloo’ and had entered Paris subsequent of the victory. He had been invalided out on a modest pension in 1819 and was the leading representative for all other likewise pensioners in the district. George passed away in 1877 at the age of 83. John attended Horwell Endowed School at Newport under the master William Mary. On leaving school he joined Mr. Bray a printer of Broad Street, Launceston as an apprentice. He then left for London where he purchased the lithographic business of Mr. Cyrus Mason, of Rathbone Place. He subsequently returned to Launceston and set up a printing business in Broad Street (he later moved the business to 11 Church Street). He married Ann Langdon in 1852 and in 1854, William, the first of their three children was born. Ann passed away suddenly in 1862. John remarried in 1865 to Elizabeth Cary Dangar and together they had six sons. On April 19th, 1856, John ran the first print of ‘The Launceston Weekly News and Cornwall and Devon Advertiser,’ which was to be the first successful local newspaper and continued until its merger with ‘The Cornish and Devon Post’ in 1931. The early issue had the following tradesmen mentioned; T. Stephens, draper of Church Street, Mr. Langdon,of the Northumberland Foundry, St. Thomas, W. Coad, draper of High Street, J. Hodge and Son and Messrs James and Ball, coaching and posting contractors, R. Robbins, of the Golden Boot, Broad Street, J. Phillips, baker and refreshment house proprietor, opposite the White Hart Hotel in Broad Street (Now the betting shop), John Dawe, auctioneer of Lewannick, and J. Geake, travel and insurance agent, of St. Thomas. John Brimmell soon found competition. He had started, as he recorded in the first issue, ‘a newspaper…pledged to the political partizanship of no party. But within eleven months, either from political or business rivalry, his competitor, the ancestor of ‘The Cornish and Devon Post,’ had made its appearance. That was in March, 1857, and it was very clear that the two papers were in opposite camps politically. John Brimmell was the Conservative and his rival on the Liberal side. John continued to run the printing business along with two of his sons, William and Sydney, and remained editor right up to his sudden death on November 11th, 1899. In his will he left a total of £2,632 19s. 3d.